Due to the redacted nature of IRS documentation; Tax Return, Wage and Income and Verification of Non-Filing documents requested from the IRS must be sent to you directly, and then a copy should be submitted to our office. Student ID numbers are required on ALL documents. Documents submitted without student ID numbers may not be accounted for properly. You may mail, email, or fax required documents to our office. If you choose to email, please redact or otherwise obscure sensitive data (SSNs) while ensuring that the student name and ID number remain visible on each page. *In an effort to release some burdens off of families who are unable to obtain Transcripts from the IRS, the U.S. Department of Education has allowed the submittal of copies of SIGNED tax returns and written statements of non-filing to be accepted for verification purposes for the 2018-19 and 2019-20 application years. This guidance is effective for all verifications conducted on or after January 9, 2019, regardless of FAFSA processing date. How can I get a Tax Return Transcript? 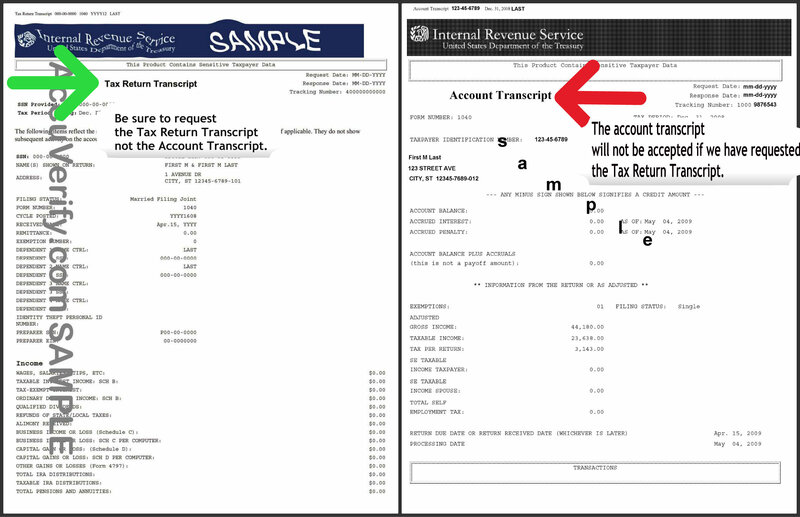 What does a Tax Return Transcript look like? What is a professionally prepared tax return?